In the distant past, monsters walk the Earth but have been banished to faraway mountain regions separate from humanity. A runaway monster queen escapes to human territory and bestows her infant child upon an inept village mayor (Jing Boran). He soon teams up with an aspiring monster hunter (Bai Baihe) to protect the baby from both the monsters that have undertaken a coup of their kingdom, as well as the monster hunters who wish to eliminate the monsters once and for all. 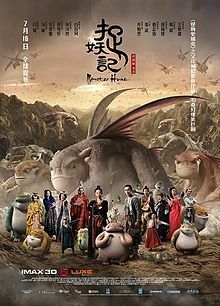 Monster Hunt was a massive hit in China last year, where it broke box office records to become the highest-grossing Chinese language film of all time (a record since broken by Stephen Chow's 2016 film Mermaid). Monster Hunt combines computer-generated effects, wuxia action, scatalogical humour and even a few musical numbers, in a sort of 'everything-in-the-pot' approach to popular filmmaking. The result is a sort of amiable yet uneven mess, one too scrappy to really rate as a genre classic but far too goofy and loveable to criticise too harshly. Director Raman Hui makes his live-action debut here, although he has a long track record as an animator and story artist for DreamWorks Animation which culminated in his directing Shrek the Third in 2007. He brings a strong visual sense to Monster Hunt, which is shot in a very commercially savvy, Hollywood-esque sort of a way. Combined with the traditionally Chinese kung fu and wirework, and the film is the most effective blend of Chinese cinema and Hollywood since The Forbidden Kingdom. Hui also brings his extensive animation experience to the film's numerous monster characters. They are not designed as realistic creatures, but rather as cartoon characters with realistic textures and additional touches. They take a little getting used to, but once they settle in they're all rather wonderful. The monster prince in particular is a beautifully created radish-like creature with a great amount of personality and appeal. Jing Boran is excellent as Tianyin, the film's awkward protagonist. He is technically mayor of a small village, but the villagers all bully him relentlessly. His father is long gone for places unknown, and his senile grandmother does not even know who he is. His two great career ambitions are to be a restaurateur and a seamster, so he makes a fairly amusing lead character for an action comedy. Jing is particularly impressive because he was a last-minute replacement: the entire film had been shot with another lead actor, who was then arrested for drug possession. The Chinese government was unwilling to allow the release of a film starring a convicted felon, and Hui was forced to reshoot about 80 per cent of the film and re-animate many of the monster elements while on a tight deadline. Kudos to both Hui and Jing for making it work so well. Tianyin is helped out by the junior monster hunter Xiaolan, played with extraordinary humour and appeal by Bai Baihe. Bai has a tremendous gift for comedy, and performs the role with a wonderfully expressive face. She handles herself well at both the comedy and the action, since it is she who tends to do most of the fighting. There is a concern as the film develops that Xiaolon will suffer from the 'Trinity effect', in which the highly competent heroic female lead suddenly steps aside when the male lead inexplicably becomes better at her job than she ever was - and in the space of a few days. Thankfully the film broadly dodges that bullet, despite moving worryingly close. The action is well staged and makes great use of the film's architecture. There is a lot of inventive bits of fantasy tossed in here and there, mostly cribbed from older Chinese fantasies, but they are meshed together well and keep the film interesting. The humour is very broad, as is the want of Chinese mass audiences, and seems to divide itself between the scatalogical and the nonsense comedy favoured by Stephen Chow. In fact the film regularly resembles Chow's own fantasy comedy Journey to the West: Conquering the Demons albeit with a more family friendly presentation. This is not a tremendously original film, but it twists its various source materials to create a pleasing familiarity. It has a few misfired jokes and an occasional lapse in energy, but all up it is all tremendously good fun. Monster Hunt 2 is due in 2017. I will be checking it out.